In this guide we will show you how to use PowerShell and Windows System Preparation Tool (sysprep) to prepare a highly customized, personal Windows 10 install image. Let me remind you, that the Sysprep.exe utility is used to prepare the reference image and its depersonalization. Sysprep allows you to delete all information related to a specific operating system, including unique identifiers (SID, GUID, etc. ), resets the Windows activation and to install apps and drivers in the Audit mode. Everything configured in the operating system before you run Sysprep (installed software, desktop, system personalization and network settings, File Explorer, installed and pinned on the start screen Metro apps and other parameters) will remain untouched. In Windows 10 and Windows Server 2016, the Sysprep.exe utility is located in folder C:\Windows\System32\sysprep directory. The Sysprep utility greatly simplifies the installation and configuration of the operating system in a large company. 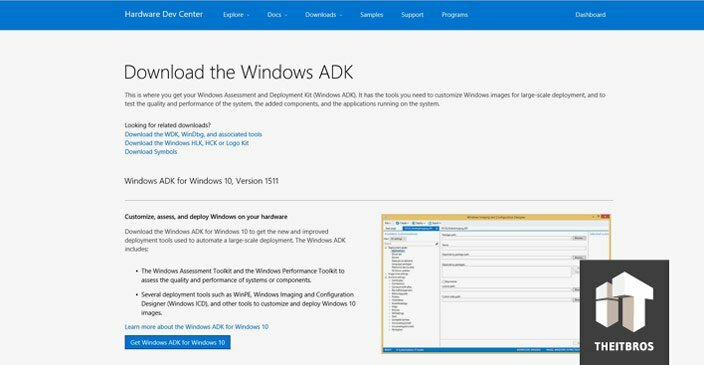 Once prepared reference Windows 10 image installed and configured in the right way (with a certain installed software, with the operating system settings, with the specified permissions and restrictions) can be deployed to all computers of the company using MDT, WDS (take a look at Deploying Windows 10 with MDT and WDS), SCCM or manually. You need to notice that in this guide we are using Build 1607 (Anniversary Update) of Windows 10, so maybe all bugs found in this guide will be fixed in later builds. Let’s start to sysprep Windows 10. 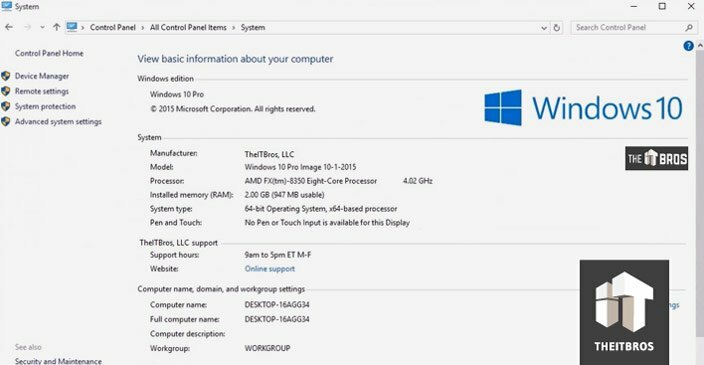 First of all you need to perform clean Windows 10 installation on your physical computer or a virtual machine. Start Windows installation normally. After reboot or two Windows is installed and process stops waiting your input. At this point we need to click on the Use express settings button. On next dialog you should not type a username, so don’t enter it (this stage of OS setup has a name OOBE — out-of-box experience for the end user). 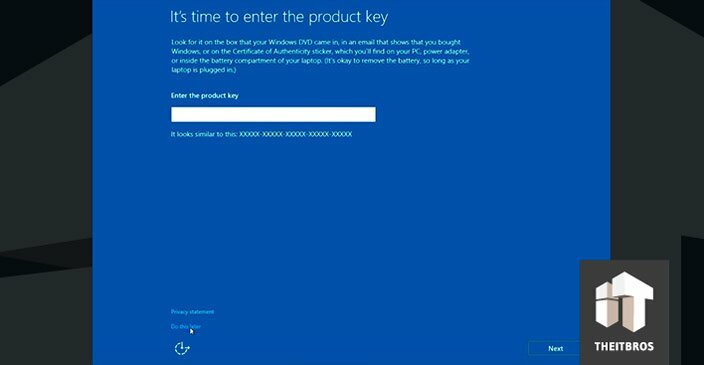 In OOBE mode, the user must complete the installation of Windows 10 and configure personal settings such as keyboard layout, account, privacy settings. Instead, press and hold down the CTRL+SHIFT+F3 keys combination. OS will now reboot to a special customization mode, the Windows 10 Audit Mode. Windows 10 will boot in this mode no matter how many times you reboot your computer, until sysprep is running. As no user profiles exist yet, Windows will use its built-in administrator account to automatically sign in to Audit Mode (this account will be further disabled). There is only one visible sign to mark that you have entered the Windows 10 Audit Mode desktop, the Sysprep dialog in the middle of the display. Do not close the sysprep utility window — you will need it at the end of the configuration step. Just minimize it. You can configure both user and system settings, and then use the answer file to copy the profile of the built-in Administrator account to the default user profile. Until now the installation was done without a network connection. So, you can connect your PC to network and configure Internet now. Once it is downloaded, run the installation file. Here you don’t need to change the location, so click on Next. After that accept the license agreement and go ahead. Now you need to select the features you want to install. 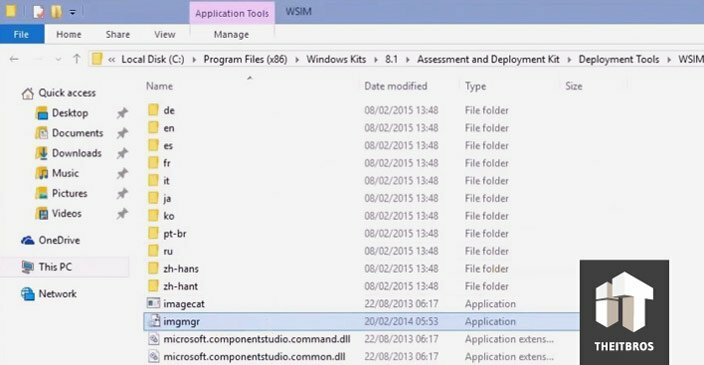 In our case, we just need to install only WSIM, so put the mark only on Deployment Tools and click on Install. Now, you need to create the oem folder in the folder C:\Windows and put there your company logo image file. Once it is done, just open up the .reg file that we have created earlier and it will automatically add these settings to the registry. After entering the audit mode, you can start installing, updating applications and configuring the operating system settings. All these apps and settings would be present in the default user profile. Default profile is used as base profile when you create new users on your Windows PC. To install default all user apps we will use PackageManagement (aka OneGet), an integrated module of PowerShell. We cannot just go to the Start Menu and to the Search, because they are disabled in Windows 10 Audit Mode. 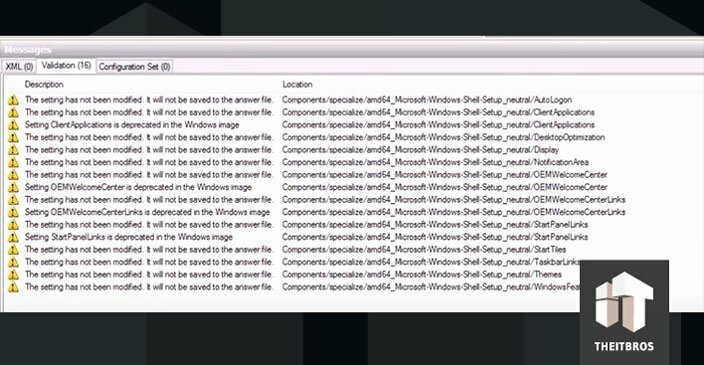 So, we need to start PowerShell manually by browsing deep into Windows folder and starting it from there. Go to C:\Windows\syswow64\WindowsPowerShell\v1.0 and then run powershell_ise.exe application. First thing we need to do is to allow you to run PowerShell scripts, in order to be able to install software from a package provider later on. All we need is just type Set-Executionpolicy Unrestricted command. Now we need to use the package manager or provider. 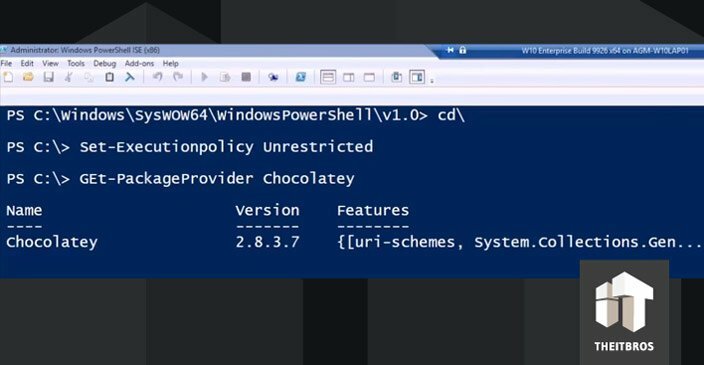 The package manager we will use now is called Chocolatey. It needs unrestricted script execution policy, which is why we set it first thing after the PowerShell had started. To add a provider we need to type Get-Packageprovider Chocolatey command. To install all the software that we need, we just have to use the PowerShell cmdlet – Install-Package. Let’s say we want to install Opera, Google Chrome, VLC, Adobe Reader, 7Zip, K-Lite Codec Pack Full and Zoomit. If you need to reboot the Windows to install the application or update, you can do it. After reboot, the system will return to audit mode. You can use our script to clear the driver store from driver duplicates. If you do not want your OS to automatically send data to MSFT servers, you can disable the Telemetry and Data Collection. Also you can disable Window 10 tracking using the DisableWinTracking tool from GitHub. Starting with Windows 8.1, in the auditing mode, you cannot install updates using the Windows Update Center in Settings panel. The Windows Update Center checks to see if the system has completed the OOBE stage (from which you are logged in). If not, the update is not performed. To automatically update the system from the console, you can take on a very handy PowerShell module — the PSWindowsUpdate Module from TechNet Gallery. Save the PSWindowsUpdate.zip archive to a USB drive and (this is important!) right click on it -> Properties -> Unblock. Unpack the PSWindowsUpdate.zip to the folder: C:\Windows\System32\WindowsPowerShell\v1.0\Modules. That’s all! Available updates will be downloaded from the Windows Update servers and installed automatically. When the update is complete, you can delete the PSWindowsUpdate module that was previously copied to the Windows folder. Also you can uninstall built-in apps, but it’s really up to you. So, if you don’t want to uninstall built-in apps, just skip this step. Paste the following scripts onto the PowerShell command prompt and press Enter. Now we need to create an Answer File. An answer file is a set of instructions in an XML file. When sysprep is run, it reads these instructions, what changes it should make to the Windows image. At first we need to create a catalog file. For that we need the install.wim file from a Windows install disk or ISO file. Note. Windows 10 Build 9926 install.wim file for some reason cannot be used for the catalog file. This will be fixed in future builds, for sure. But for now we have a workaround. 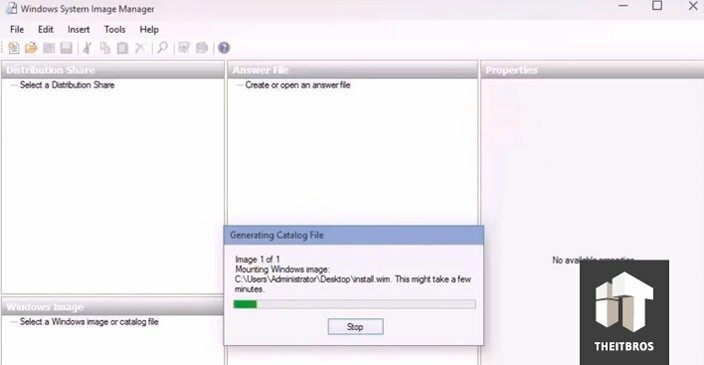 To get an answer file for our Build 9926, at first we have to create the catalog using Windows 8.1 or Windows 10 Builds 9841, 9860 or 9879 install.wim file, and later edit the answer file. Find the install.wim on any install media for above mentioned Windows versions and copy to the desktop of the PC you are using for this process now. The install.wim can be found in Sources folder in any Windows install media. We are using the install.wim from Windows 8.1 Update 1. Open Windows System Image Manager. Now, create a new answer file, and select the install.wim we just copied to the desktop. Creating the catalog will take quite a long time. Once it is done, we need to do the most important thing, set the CopyProfile value to TRUE. This setting is telling Sysprep to copy all our customizations to the default user profile. In the answer file you can configure any other system options that you want to use, for example, the Windows product key (if you are using KMS or MAK keys), time zone, organization and owner info, default language and region settings, input locales, etc. Once it is done, let the Windows SIM validate your answer file and check it for errors. Click on Tools -> Validate. In our case it is nothing to be worried about, only warnings about some deprecated settings no longer possible to change, and notices that because we did not change some settings, they will be left out. Now, we can save the answer file and name it as we want to. But the file extension must always be .xml. Save the answer file to root of any drive other than C:. After that you can delete the install.wim and catalog files from the desktop. Because the install.wim file that we have used is not belonging to the version of Windows we will Sysprep, the answer file must be edited. So, open it in Notepad. 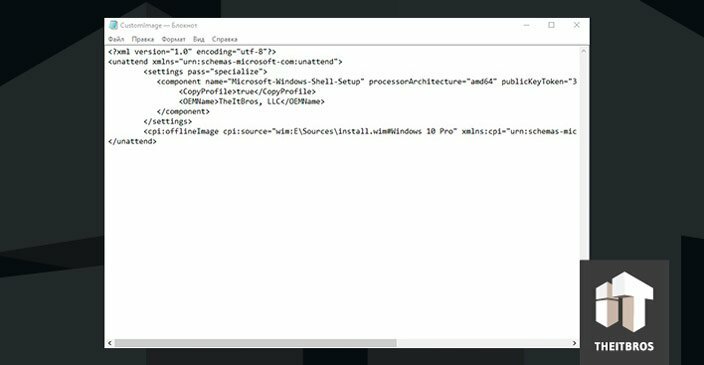 Change the path to your Windows 10 install.wim file at the bottom of the answer file. In our case we need to change drive and Windows version to Windows 10 Pro. Now, save this file as CustomImage.xml on the drive D:. After your create your answer file you can run sysprep. 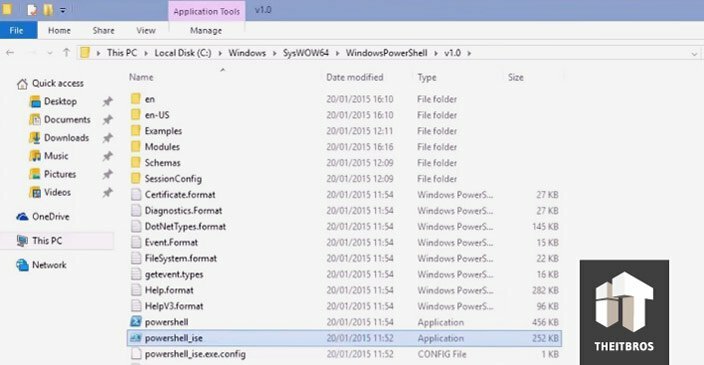 Open up Command Prompt as admin. In our case the answer file is on the root of the drive D:. Change the command according to where your answer file is located. Tip. 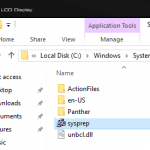 If you run sysprep with the /copyprofile option, the local user profile will be copied to the default user profile, and then will become the default profile in the Windows 10 image. Sysprep will apply you answer file and shutdown the computer. 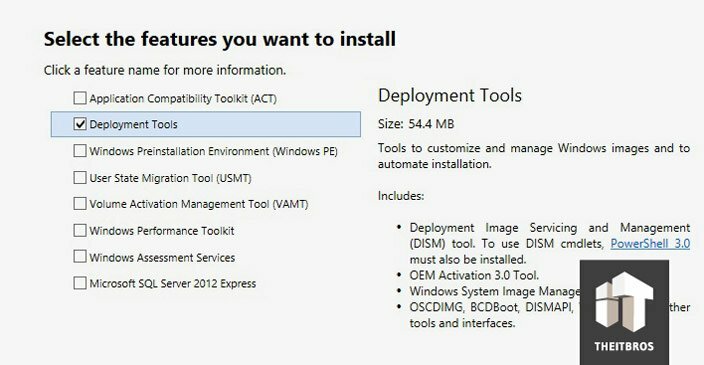 Now this image ready to be deployed on other devices with your default user profile using your choice of imaging software (you can capture and deploy this image using MDT). Tip. If during running Sysprep an error appears: Sysprep Was Not Able to Validate Your Windows Installation, read carefully the following guide. When the computer has booted to imaging and recovery tool, create a system image according to instructions for the program you are using. Once it is done, shutdown the computer. You have created a generalized, highly customized Windows install image which can be restored to any computer instead of installing. Restoring takes only half of the time needed for installation. Start PC normally to finalize the installation. The Welcome phase first boot is a bit different in a Sysprepped Windows. You will be asked to enter the product key. This is of course not necessary, you can skip it. Now, create a local account. 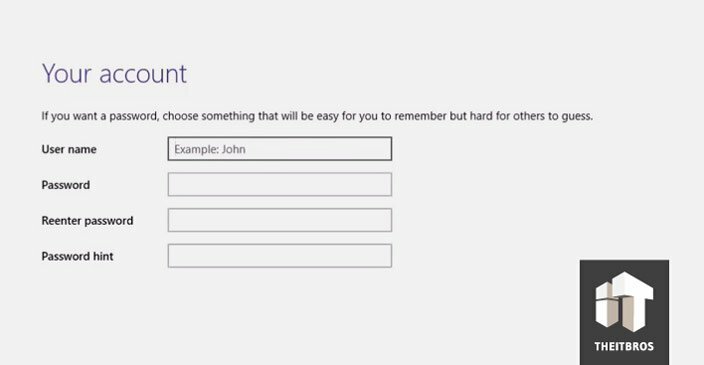 You can later change it to a Microsoft Account. Finally, we did it. After installation you will see that all customizations are there, all software you installed in Audit Mode are there as well. That’s all. If you have any questions about this Sysprep Windows 10 tutorial, you are free to leave them in the comments section below. Hello, need some help here please. I have setup a win 10 64-bit computer with all latest ms updates, device drivers, and applications. I have enabled local hidden admin, created two other local admins as well. I have activated Windows 10 already since we have VL licensing. After re-imaging, I would for it to only prompt user for computer name. We will add to our domain manually for now. We create disk image using symantec ghost to deploy to similar model desktops/laptops with UEFI bios. With this info, what passes and settings do I use on my unattended file. Your advise would truely be appreciated, I will donate as well as your articles are very useful. Thanks for this great article! But, there is a problem with the CTRL-SHIFT-F3 reference, it doesn’t work at the Windows 10 user account creation screen as mentioned above. It DOES work at the Settings screen though. I’m also trying to figure this out. I set up the image as a single partition on the drive initially for simplicity, and here it’s suddenly telling me I was supposed to have an extra partition as drive d where this is all stored. Some explanation would be most helpful here. I have been working on doing this for quite some time now, and I think I have this question sorted. From what I can see, the unattend.xml WOULD need to be a the root of some other drive IF you were using it for installing windows from the beginning e.g. partitioning the hard disk. In this case of course you would need it on a different volume and of course you would need access to install.wim. However, if windows is already installed and in Audit Mode, you can simply place your unattend.xml or whatever it is named somewhere on the windows partition (beware it may contain passwords obfuscated or not) in a system folder and run sysprep with “/unattend:C:pathtoyourunattend.xml” as a flag. Because sysprep copies the unattend to C:WindowsPantherunattend.xml where windows looks for it during the generalize phase anyway, it doesn’t matter where it is, because windows will find it and run it from there. Hope this helps! 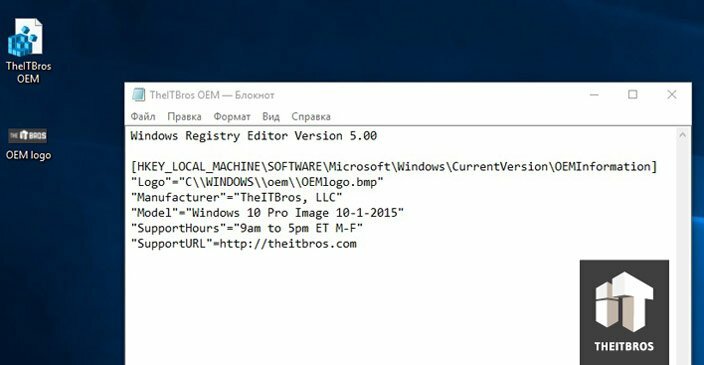 How can I upgrade my customized image to Windows 10 1607? Is it possible? Thank you very much for this write-up. It is working great. However, I have one question…I was just about done, but decided to shut down the PC and do a Ghost Image before running Sysprep. Now after booting back up, I’m unable to get back into Audit Mode. Just tells me that the Administrator account is disabled. “The system will now shutdown and is ready to be imaged using your choice of imaging software. Is there no longer a way of enabling the local Administrator account through the answer file (as you had explained in the Windows 7 version of this article)? 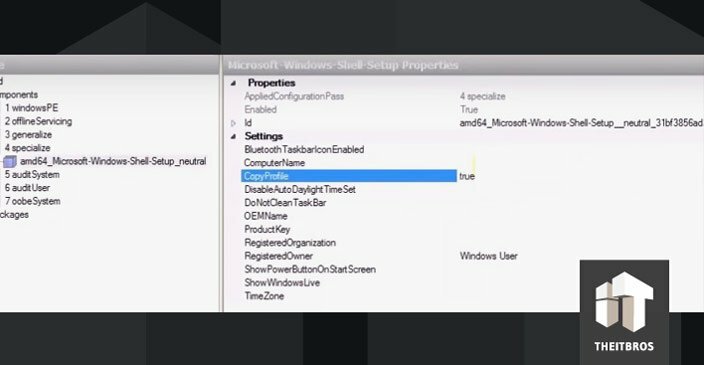 You can add a SetupComplete.cmd script by creating a Scripts folder in the directory windowssetup. Your script would be: net user administrator /ACTIVE:YES. If you already have a Setupcomplete.cmd file already, just add this to it. It worked for me. The article is great. I have two burning question. I already have a Windows 10 Ent. x64 computer already built with all our software and drivers installed. Can I just sysprep it? Do I need to build it in audit mode before sysprepping? There seem to be a bunch of hacks, but I haven’t found anything totally foolproof – anyone have any more insight on this as it’s really problematic if we can’t sysprep our machines!! I had the same problem and looked in the log-file proposed. I saw there was a problem with an APP (Adobe Acrobat Reader thing). I uninstalled the app and downloaded the application (=program) instead. Then I didn’t get this annoying message when Syspreping and succeded! You may think that removing Candy Crush or Netflix is doing your company a favor, but if an employee is spending too much time gaming, that’s really a managerial problem, not IT. We travel a lot in my company and Netflix is used on planes – I’m sure someone has played Candy Crush as well. For example, if you remove the People app, then you break MyPeople or potentially any other app with sharing built in. Another example: MS Paint has a link to Paint 3D. You will break that link if you pull Paint 3D. 3) By pulling apps, are you going to break a future upgrade? IT is famous for customizing stuff and causing problems later. I saw one person suggest that the Photos app be removed because it was too basic. The alternative photo viewer was Paint! Who in their right mind wants to view photos in Paint? Besides, Pain will be removed from the next version of Win10. and in the 4 steps you used “chocolatey” …how it’s possible to use this package manager without internet connexion ? And that’s for sure: when using chocolatey the internet connection is absolutely necessary! The oem image is not showing up. Does is have to be a specific size? Awesome article, thank you. A newbie question – when you are sysprepping, are you overwriting your original file installation? Or are you creating a completely new disk image separate from the base operating system with the systems specific settings tripped out? Am learning how to do this to automate my tech classroom deployments. When I sysprep I get a blue screen with an awesome frown face. Any ideas? I have the network cable unplugged and still unable to get it to work. Just used this guide to sysprep Win 10 Ent 1803. There is a bunch of steps missing in part 7 where imgmgr.exe is used to create answers file. Had to google it. Otherwise the process completed without any issue. Currently I am interning for IT department and we are running into problems when installing our new image. After setting up the image with the wim and answer file with our edits removing apps sysprep ignores our customization and puts in all the apps we wanted removed. Has anyone else run into this problem? The search box stops working and I suspect it has to do with CopyProfile no longer working as intended in the latest Windows 10 build. Anyone know how to resolve this? Thank you for the way you expain sysprep step by step. Great page! But! TheWindows 10 sysprep portion should have a clear example like your Windows 7 sysprep guide. Also your bloatware script cannot be run before imaging after 1709. If the removed apps keep coming back after sysprep and after creating new user accounts, try this. Worked for me. No Sysprep errors. why i need go to audit mode in sysprep options? Has anyone used this with Version 1809? is it possible to use this way of config for windows 10 ? ?